If you are looking to pick up a shiny new smartphone in the next few months there is certainly a lot of worthy hardware to choose from. Away from the likes of Apple and Samsung we also have some feature packed devices coming from LG and Motorola, and today we have the AT&T and Sprint LG Optimus G compared side by side in a video. LG looks to have been rather busy recently after the Optimus G has been confirmed for a couple of carriers in the US, and the company is reportedly working on a Nexus device that is supposed to be actually based on the Optimus G.
Now the guys over at Android Central have got their hands on the AT&T and Sprint versions of the Optimus G, and compared the handsets in a video that can be seen below. The two handsets may both have the Optimus G badge on them, but there some differences in the two handsets. The Sprint version has nice rounded corners while the body of the AT&T version has sharp corners, and the back panels on the two versions also differs. Purchasers of the AT&T version will have the carriers logo plastered on the device, while the Sprint model has no logo except Sprint ID in the software. There is more of a difference when it comes to the handsets camera though as the Sprint version packs a 13-megapixel sensor, while AT&T customers will only get an 8-megapixel shooter. 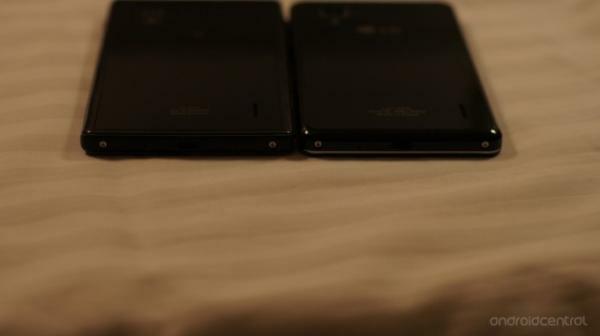 The rear panels have some subtle differences to the pattern, and look similar to the leaked LG Nexus handset. Both versions come packing the all important quad core Snapdragon S4 Pro processor powering the 4.7-inch IPS+ HD display, which is coupled with 2GB of RAM. Besides the minor differences the device will certainly hold its own on whatever carrier you choose to purchase it from. Are you thinking of buying the LG Optimus G? Previous article Previous post: Sharp Aquos Zeta SH-O2E healthy specs for Japan, demand elsewhere?